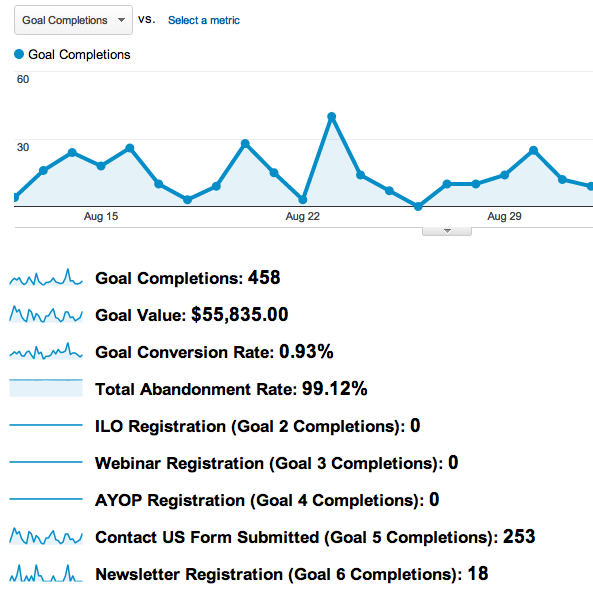 How to Incorporate Goals in Google Analytics. How to Interpret Reports for Analyzing Goals. A goal can be any activity on your website that is important to the success of your business. For simplicity, a web page which displays a confirmation for submitting an order could act as a goal. Each time a visitor meets a particular criteria, a goal is recorded. During a single session, a goal can only be counted once. To assess how well your website meets your business objectives. To estimate revenue for a non Ecommerce website. To find out how many visitors are becoming customers. URL Destination A goal is recorded when a visitor views the specified page on your site. Order completion page. Time on Site Goal will be counted when a visitor spends more or less time on your site than the predefined threshold. Measure of stickiness, to verify if a particular page is engaging enough. Useful for web portals. Pages/Visit Goal will be counted when a visitor views more or fewer pages than the threshold. To verify depth of the visit. Useful for content websites. 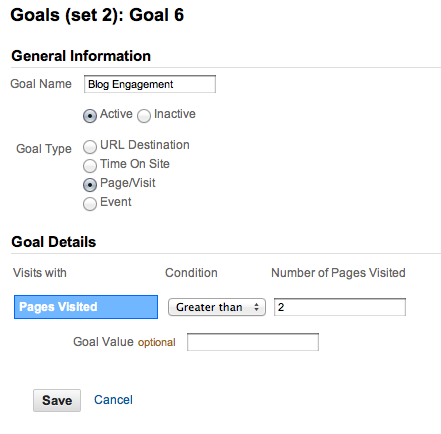 For a single profile in Google Analytics you can create up to 20 goals in total. These goals are segregated into four sets; every set allows you to create up to five goals. Tips: In order to create more than 20 goals for a website you will have to create a duplicate profile for the same website which will give you four more sets of goals to track. Enter the goal URL for your goal page. Select your preference for case sensitivity. Enter the value for your goal (non Ecommerce site). Google Analytics uses an assigned goal value to calculate ROI, Average Score, and other metrics. For a non-Ecommerce site such as a sales lead generation site, Google Analytics can use an assigned goal value to calculate the monitory value associated with the completion of a goal. Select an appropriate condition (e.g Greater than or Less than). Enter an amount of time in the form of whole integers. Select an appropriate condition (e.g. Greater Than, Less Than or Equal To). Enter the number of pages as your criteria. Assume that remotecourse.com is a non Ecommerce website. Develop a goal to measure sales leads generated on remotecourse.com. Apply a monetary value to every sales lead obtained via this website. From your Google Analytics Settings page, first select the appropriate account (e.g. RemoteCourse) and then select a profile for which you wish to create a goal. Click on Edit in the actions column to edit the profile settings. 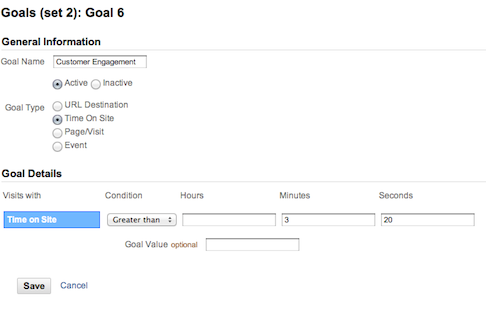 Click on the +Goal tab and you will be taken to the Goal Settings page. Provide a relevant Goal Name, (e.g Sales Leads). 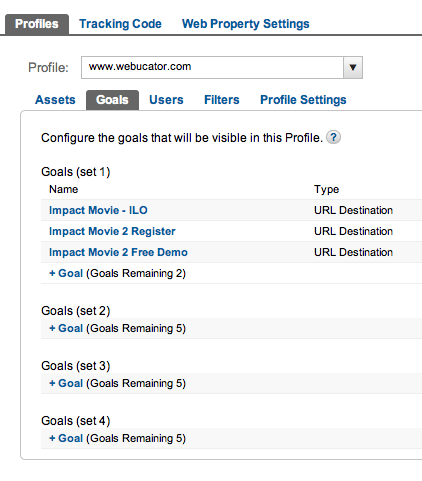 Select the Goal Position, (e.g Set1, Goal1) and choose your Goal Type as URL Destination. In the Goal Details section, select the Match Type as Exact Match and copy-paste an appropriate URL into the Goal URL field. 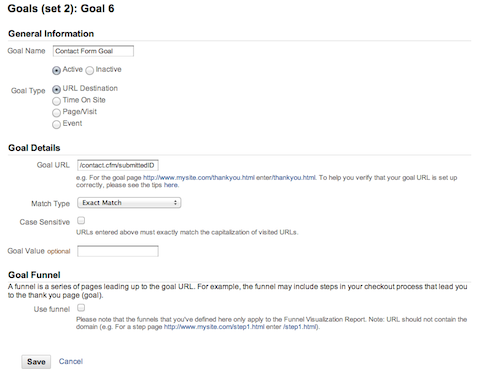 Select the Case Sensitive option to match the capitalization of your goal URL. To assign a goal value, let us assume that the average order value from a sales lead is $200 and Webucator is able to close 20% of their sales leads. Under these assumptions, the goal value will be 20% of 200 = $ 40. Click on Save Goal to complete the goal creation process. A product company added a new troubleshooting section to their website. You would like to measure its effectiveness. Accomplish this task using Goals in Google Analytics. Provide a relevant Goal Name, (e.g Time on Site Goal). Select the Goal Position, (e.g Set2, Goal1) and choose your Goal Type as Time on Site. Assume that the average time on site before adding the troubleshooting section was 2 minutes and 30 seconds. You expect that people will at least spend an extra half minute to check the newly added troubleshooting section. Thus, in the Goal Details section, select the Greater than condition and set the time criteria to 3 minutes. Your company added a products and services catalog to your existing site. You would like to measure its effectiveness. Accomplish this task using Goals. Provide a relevant Goal Name, (e.g Pages Visited Goal). Select the Goal Position, (e.g Set3, Goal1) and choose your Goal Type as Pages/Visit. Assume that your catalog has 10 pages and you decided to record a goal after someone views 5 or more pages. Thus, select the condition as Greater Than and set the pages criteria to 4. Purpose: Provides a quick glance at the total number of goal conversions, the goal conversion rate and the total goal value for a non e-commerce site. The overview page cannot be customized to show particular metrics. The number of goal completitions and goal values determined per goal URL that has been setup. This report shows you a table on how visitors reached the goal page and which path they followed, in reverse order. This report shows a graphic of how visitors reached the goal page, and then how many visitors continued along your desired goal path. 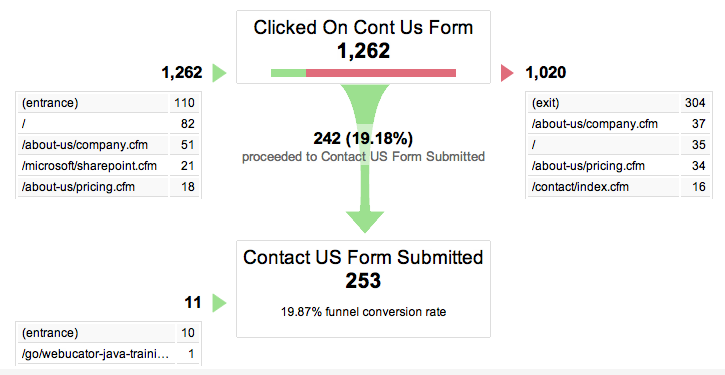 This graphic will also show if/when visitors may have left your funnel process. This report enables you to view which traffic-related metrics, such as your sources, which has brought you the most goal conversions.